Those Who Spring of Me is an independent feature film about a young non-verbal man with autism, Will, and his girlfriend, Tatum, who also has autism. Will and Tatum met on the job, and Will communicates through supported typing on a voice output device. Will and Tatum announce to his parents that they want to conceive a child together—they also ask for permission and assistance when the child is born. The film is currently in production during the summer and fall of 2016. This Columbus, Ohio production is taking place in the Clintonville, Glen Echo, SoHud and other Campus Communities. 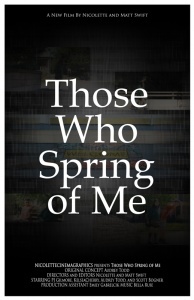 Those Spring of Me is a first time collaborative feature film project combing the writing talents of Audrey Todd with the filmmaker background of Nicolette and Matt Swift. The film starts PJ Gilmore, Kelsea Cherry, Audrey Todd, and Scott Bogner. Emily Gabrelcik is serving as production assistant and the sound track will include selections of music from Bella Ruse. Finally, Those Who Spring of Me is made possible by continued support from the Greater Columbus Arts Council, Ohio Arts Council, and VSA Ohio. Visit the films independent site for more details.